Sgt. 1st Class Nathan R. Chapman was a Special Forces Communications Sergeant assigned to 3rd Battalion, 1st Special Forces Group (Airborne). 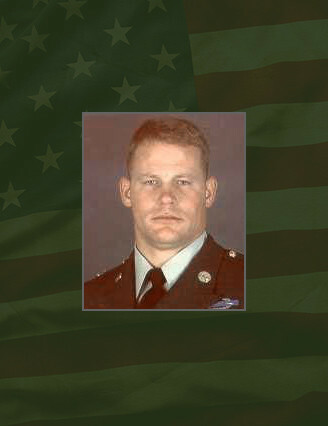 He was killed in action during Operation Enduring Freedom on Jan. 4, 2002, near the town of Khost in Afghanistan. Sgt. 1st Class Chapman was born into a military family at Andrews Air Force Base, Md., on April 23, 1970. As with most military children, he called several places “home” during his childhood. While growing up, he balanced his time between his academic studies, the wrestling team and an active social life. In 1988, he graduated from Centerville High School in Ohio. Nathan entered the Army in July 1988, completing Basic and Advanced Individual Training as an infantryman at Fort Benning, Ga. After that, he also completed his parachutist and Ranger training there. Following his initial training at Fort Benning, he was assigned to Company A, 2nd Battalion, 75th Ranger Regiment, Fort Lewis, Wash. In December 1989, he participated in his first combat action when he took part in the 2nd Ranger Battalion’s airborne assault into Panama during Operation Just Cause. In January 1991, while assigned to 3rd Battalion, 47th Infantry Regiment, he participated in his second combat action when he deployed to Saudi Arabia as part of Operation Desert Storm. In September 1991, Sgt. 1st Class Chapman volunteered for Special Forces training. In December 1992, he graduated from the Special Forces Communications Sergeants Course at Fort Bragg, N.C., and went on to complete the Basic Military Language Course for Tagalog in June 1993. In July 1993, he returned to Fort Lewis, Wash., where he was assigned to 3rd Battalion, 1st Special Forces Group (Airborne). Here, he served on Operational Detachment A-185 and Operational detachment A-195. In 1995 he deployed to Haiti as part of Operation Uphold Democracy. In 1998, Sgt. 1st Class Chapman was reassigned to 1st Battalion, 1st Special Forces Group (Airborne), in Okinawa, Japan. He served there for three years as a member of Operational Detachment A-125 and Operational Detachment A-135. In June 2001, he returned to 3rd Battalion and became a member of Operational Detachment A- 194. In November 2001, Sgt. 1st Class Chapman volunteered for a special mission in Afghanistan, where he participated in Operation Enduring Freedom. Sgt. 1st Class Chapman was a highly decorated combat veteran whose awards and decorations include the Bronze Star with “V” device, the Purple Heart, the Meritorious Service Medal, the Army Commendation Medal with Oak Leaf Cluster, the Army Achievement Medal with three Oak Leaf Clusters, the Humanitarian Service Medal, the United Nations Medal, the Kuwait Liberation Medal, the Southwest Asia Service Medal with Bronze Service Star, the Armed Forces Expeditionary Medal with arrow head, the Army Good Conduct Medal (3rd Award), the Armed Forces Service Medal, the Joint Meritorious Service Unit Award, the Army Superior Unit Award, the Combat Infantryman Badge second award, the Master Parachutist Badge, the Parachutist Combat Badge with bronze service star, the Special Forces Combat Divers Badge, the Special Forces Tab, the Ranger Tab, and the Royal Thai Army Parachutist Badge. He is survived by his wife, Renae, his daughter Amanda, his son Brandon and his parents Will and Lynn Chapman.